Flood damage from Irene, Middlebury VT, 2011. You rebuilt after Irene. Your pastures grow lush and green, despite the sand that smothered them after the floods. Your new chicken tractors are lighter than the ones that the current toppled and twisted. Your sales are looking good. But sometimes you wonder: Is rebuilding the same farm system really the answer? You know that more intense rain – more frequent rain – is part of the new normal of climate change. What could you do to make your farm more adaptable, more resilient to increased flooding? In an effort to help farmers answer these questions, NOFA-VT is partnering with conservationist groups and UVM Extension. Together, we’re offering two Summer Workshops about concrete ways you can build your flood resilience. Both events focus on strategies Vermont farmers like you are using to deal with increased flooding. At each workshop, we aim to give farmers a chance to talk together about what’s working (and what’s not) on your farms. There will be an opportunity to talk about how farmers are funding and getting their resiliency projects implemented. We’ll also take time to think about what next steps we can take to be Vermont strong in building our resilience to flooding. You know cover crops are good for soil fertility – but did you also know they can be a critical and practical tool for flood resiliency? As the effects of this summers’ early season flooding lingers in the fields, come learn about strategies to mitigate the long term impacts of soil saturation. Lindsey Ruhl, Master’s Candidate in Plant and Soil Sciences at UVM, will take participants into the field to look her research sites and experimental cover crop plots in the Intervale. She will present on cover crops that have demonstrated ability to alleviate specific effects of soil degradation associated with flooding such as fertility loss, compaction, and mycorrhizae colonization. You can see the progress of Lindsey’s research on her Flooded Soils blog. This event will be part field tour and part discussion over light refreshments and snacks. 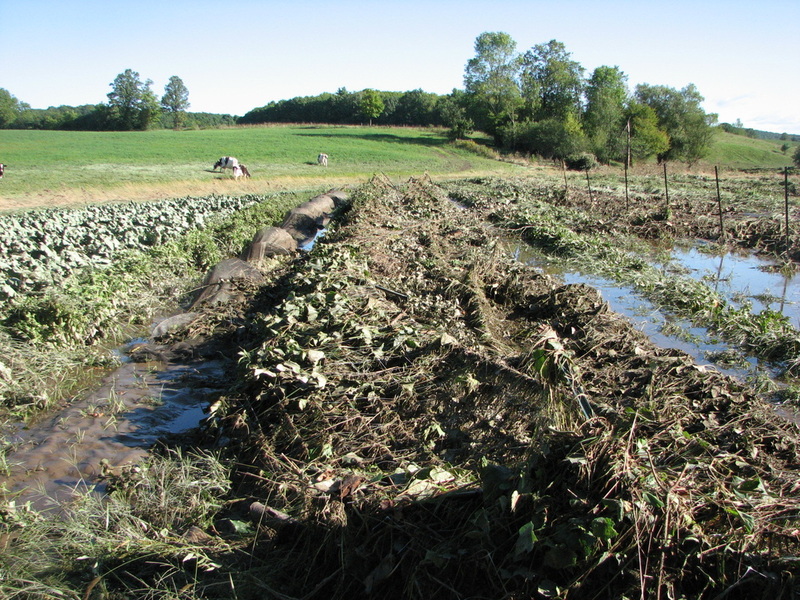 Streamside buffers can protect crops and improve water quality. Image courtesy Liz Brownlee. Do you farm along a waterway? Are you involved with conservation projects in your community? Join us for a field day to learn how to build farmland flood resilience. This NOFA-VT field day show will showcase a tried and true tool for dealing with flooding on farms: the planting of streamside buffers. Planting trees along streams and rivers can absorb floodwaters, protect soils, and keep drinking water clean. 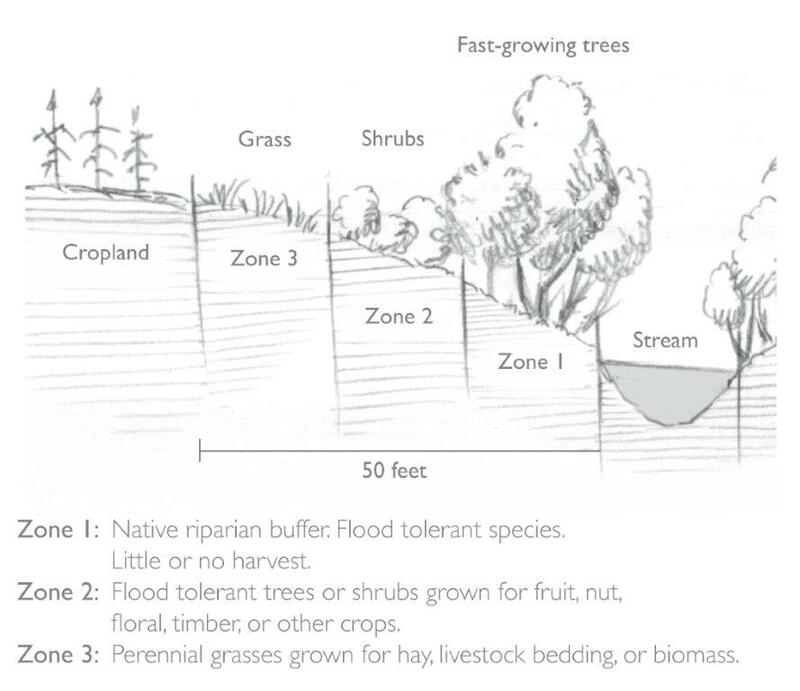 Learn how buffers work, what plant species work for buffers and where to find them, and what programs can fund plantings on your farm or in your community. Hear from two farmers about their experience with planting buffers. Explore a mature buffer planting at the Intervale on a walk into the field with staff from the Intervale Conservation Nursery and tour their nursery as they take your questions about native tree plantings. This is unique opportunity to talk with farmers, conservationists, and researchers about the challenges and opportunities for building more resilient Vermont farms. The Summer Workshop Series continues through mid-October; click here to see all upcoming workshops!